You probably thought the hard part was over when you finally laid out the cash for your perfect living room or dining room set. Little did you know that the job had just begun! If furniture makes a house liveable, it’s the accent pieces that make a house into a home. Don’t worry, though: Trust your instinct when you hit the stores, and use these tips for choosing accent pieces that are sure to enhance a room. Overhead lighting is all well and good, but adding table lamps, floor lamps and shelf lighting to your home will actually add dimension to your space. Skip the neutral lamps that blend in with your overall decor and look for fun, colourful pieces to help show off your personal style. We love the Chirp pendant lamp available at STL LoftStyle for $446. It may be a little quirky, but it’s definitely a conversation starter! If that’s too much for your more conservative style, consider a clear glass table lamp in an accent colour that complements your overall decor. 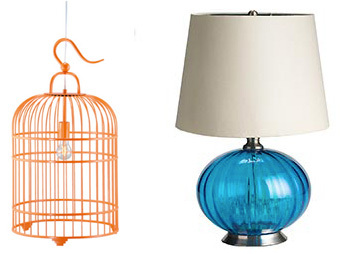 The turquoise glass lamp from Pier 1 Imports would look gorgeous in a space with a neutral colour palette. Large, blank walls can quickly take over a room, so it’s important to look for accent pieces that help break up the space. When it comes to decking your walls, think about the functionality of the room you’re decorating. If it’s a relatively small space, consider hanging an interesting mirror directly across from a window. Not only will the mirror create the illusion of space, but when it reflects the sun’s light, it will also make your room brighter! Mirror Image, Gold leaf contemporary sunburst mirror, contact for pricing (on left). For high-traffic areas, look for accent pieces that will help with organization and storage — baskets, coat hangers and decorative trunks can all be functional and stylish. 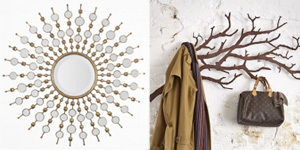 For the home with a rustic, earthy decor, we love the tree branch wall hanger from Karmakiss, available for $110 (on right). Small pieces of furniture are great ways to accent your space. 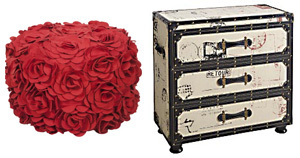 Look for chests, tables, chairs and ottomans that complement your overall decor but don’t blend into the background. For instance, If you’ve chosen a black leather living room set, look for sleek lacquer tables or mod arm chairs in a bold red or bright white. The style of the accent piece will blend into your space, but the color will make it stand out, adding interest to your room. Remember that accent furniture can make a space more functional. An accent ottoman like the Surya Teal Pouf Pillow Ottoman from STL LoftStyle (on left) looks cute as can be, doubling as extra seating when you’re hosting a crowd. Likewise, the Rhodes Chest from Pier 1 Imports (on right) would be perfect for storing table linens and barware when used as an accent piece in a dining room. When your decorating goal is to enhance a room, not all of your accent pieces need to be big or bright. Some of the best accents are small, simple and fun. Think of your room like an onion: You want your guests to keep peeling back layers of your decorating personality as they look around your space. If your furniture, colour palette and lighting are the outer layers, you want your smaller accents to be an added surprise. Choose pillows, bookends, vases and candles that cater to your sense of humor or that display your favourite hobbies. We love simple conversation starters like the white hand bookends available at Karmakiss for $33.